When we walked the stretch of the Great Northern Railway Trail from Thornton to Queensbury, my mate Richard and I were puzzled by the undulations in the former trackbed. There were steep sections that couldn’t possibly have carried a railway train. It became apparent that whole stretches of the line had been infilled. Indeed, at the site of the triangular Queensbury Station it’s impossible to work out where the railway went without recourse to the old maps on the very useful interpretation boards. We walked a couple of hundred yards along the trackbed towards Halifax to look at the north portal of Queensbury Tunnel, where repair work is underway in preparation for filling it in (if the Historical Railways Estate has its way) or restoring it as a cycle path (if the Queensbury Tunnel Society succeeds in making its case – http://www.queensburytunnel.org.uk). Outside the portal stands a new wooden cross commemorating the ten navvies who died during the construction of the tunnel. Landfill in the Strines Cutting at the southern end of the tunnel has flooded it to half its length: https://en.wikipedia.org/wiki/Queensbury_Tunnel#/media/File:Queensbury_Tunnel_flooded_south_entrance.jpg. We could only guess the location of the nearby Clayton Tunnel on the line to Bradford, because its approach has been completely obliterated by landfill. 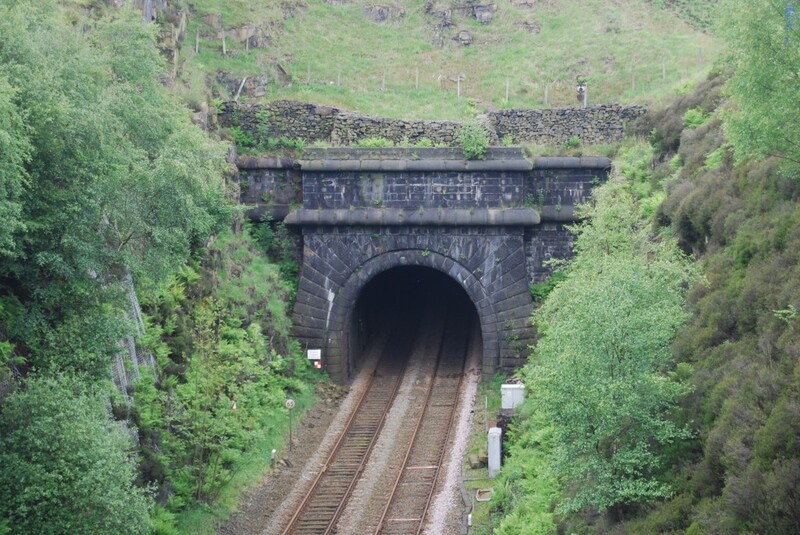 In fact, the west portal is visible and accessible if you know where to look – http://www.lostrailwayswestyorkshire.co.uk/images/donations/Grahame%20H%20Beacher/!cid_.jpg – and almost all of the tunnel’s 1,057-yard length is intact though dangerous, but the east portal is filled in – http://www.lostrailwayswestyorkshire.co.uk/images/donations/Graeme%20Bickerdike/Clayton%20Tunnel/clayton-1.jpg – and the approach cutting has completely disappeared beneath a housing estate. In the 1960s, when these railways lost their traffic to road transport, hardly anyone envisaged their alignments might have a future purpose. Campaigners argued to retain the train services, and routinely lost. The conservation argument that planning policy could safeguard miles-long continuous corridors of land by making them available only for reversible purposes simply wasn’t made in time. Opening up abandoned railways in the Derbyshire Peak from the 1970s onwards has given millions of tourists healthy pleasure on the Tissington, High Peak and Monsal Trails. Indeed, in Sussex the Bluebell Railway cleared a huge filled cutting as part of a successful scheme to restore services from Sheffield Park to East Grinstead, removing much of the spoil by rail. The Great Northern Railway Trail is a laudable attempt to bring people into the West Yorkshire countryside, but the short-sighted disposal of solid Victorian infrastructure a generation ago has compromised the vision for the future. That’s why it’s so important that the practical, economic case for the reopening of Queensbury Tunnel is sustained. There is a well-written and well-illustrated account of the railways that met at Queensbury – Martin Bairstow, The Queensbury Lines (Amadeus 2015): https://www.amazon.co.uk/Queensbury-Lines-Northern-Railway-Riding/dp/1871944449/ref=sr_1_fkmr0_1?ie=UTF8&qid=1551044322&sr=8-1-fkmr0&keywords=Martin+Bairstow%2C+The+Queensbury+Lines+%28Amadeus+2015%29. There is also an oddly spooky evocation in virtual world of railway simulations: https://www.youtube.com/watch?v=msL3L5t1uAs. This entry was posted in Transports of Delight, Waterways & Railways across the Northern Pennines, Yorkshire Mills & Mill Towns on March 22, 2019 by Mike Higginbottom. Anyone who’s visited the Keighley & Worth Valley Railway will be familiar with Keighley railway station, where main-line trains between Leeds, Skipton and beyond connect with the Oxenhope branch that is now the heritage railway. Keighley branch platforms used to serve another route, spectacular to ride and difficult to operate, known formally as the Great Northern Railway’s Queensbury lines and unofficially as the “Alpine Route” for its steep gradients, sharp curves and heavy engineering works, a Y-shaped system connecting Bradford, Halifax and Keighley. Opened in stages between 1874 and 1884, the junction between the three routes lay in the valley bottom at Queensbury, a highly unusual six-platform triangular station. The only other true triangular station in Britain was at Ambergate, Derbyshire. The village of Queensbury, home of the famous Black Dyke Mills, was four hundred feet higher, accessible only by a dimly-lit footpath. By 1901 Queensbury had electric tram services to Bradford and Halifax, so most of the rail passengers used the station simply to change from one train to another. Queensbury station has, sadly, been obliterated, but its location is the starting point for the Great Northern Railway Trail, which Sustrans and Bradford City Council have developed, firstly between Cullingworth and Wilsden in 2005, and then a separate section between Thornton and Queensbury between 2008 and 2012: https://www.sustrans.org.uk/sites/default/files/images/files/Great%20North%20Trail%202012.pdf. The long-term aim is to provide a trail along much of the original rail routes between Bradford, Halifax and Keighley, but there is an immediate problem which needs an imminent solution. Immediately south of Queensbury station, the line to Halifax ran through Queensbury Tunnel, 2,501 yards long, which has a constant gradient of 1 in 100, so that the north portal is seventy feet higher than the southern one. After the track was lifted in the early 1960s, the Strines cutting to the south of the tunnel was sold as a landfill site, without adequate drainage, so that the run-off from within the notoriously wet tunnel backed up to a depth of thirty-five feet in the cutting, flooding the graded bore to almost half its length. The Queensbury Tunnel Society has mounted an energetic campaign, supported by Bradford City Council, to reopen the tunnel as a lit, paved cycle-way, using resources that the current owner, Historical Railways Estate (HRE), part of Highways England, had allocated for a short-sighted scheme to infill the bore. Infilling for 150 metres at each end and capping the ventilation shafts was estimated to cost £5.1 million; a cheaper scheme filling only 20 metres at each end would cost around £3 million. The Queensbury Tunnel Society’s estimate for remediation to Network Rail standards would cost £3.3 million, and the installation of a cycle path and lighting would cost a further £1.5 million. The Society argues that taxpayers’ money would be better used for a scheme which delivers social and economic benefits, rather than one which renders the empty tunnel permanently unusable. Detailed accounts of this controversy can be found on the Society’s website [http://www.queensburytunnel.org.uk/index.shtml] and at https://www.railengineer.uk/2018/07/12/securing-a-future-for-one-of-englands-longest-disused-railway-tunnels. The latest development borders on farce: https://www.keighleynews.co.uk/news/17367798.flooding-adds-to-tunnel-bill. This entry was posted in Transports of Delight, Waterways & Railways across the Northern Pennines, Yorkshire Mills & Mill Towns on December 1, 2018 by Mike Higginbottom. In the 1960s it made perfect sense to highway engineers to clear a bottleneck in the road through Sowerby Bridge by clearing away two locks of the Rochdale Canal. After all, no boat had travelled along the canal since 1937, and it had been formally abandoned in 1952. As a waterway, it couldn’t possibly be of any further practical use. In fact, within a decade, after the safeguarding of the Ashton Canal which connects with the Rochdale, there were serious proposals to restore the Rochdale to link Lancashire and Yorkshire more directly than the remaining Leeds & Liverpool Canal. Over nearly twenty years the Rochdale Canal Society invested energy, time and money – in practical and political terms – to bring back through navigation. This involved circumventing road improvements, dealing with mining subsidence, demolishing a Co-op supermarket and – at Tuel Lane, Sowerby Bridge,– engineering the deepest canal lock in Britain, opened in 1996. Tuel Lane Lock is numbered 3/4, because it replaces two in the sequence of ninety-two locks that end in Manchester’s Castlefield, and it’s 19 feet 8½ inches deep. The major engineering challenge was to ensure that the lock could take the full-sized seventy foot barges that all the other locks on the canal were designed for. 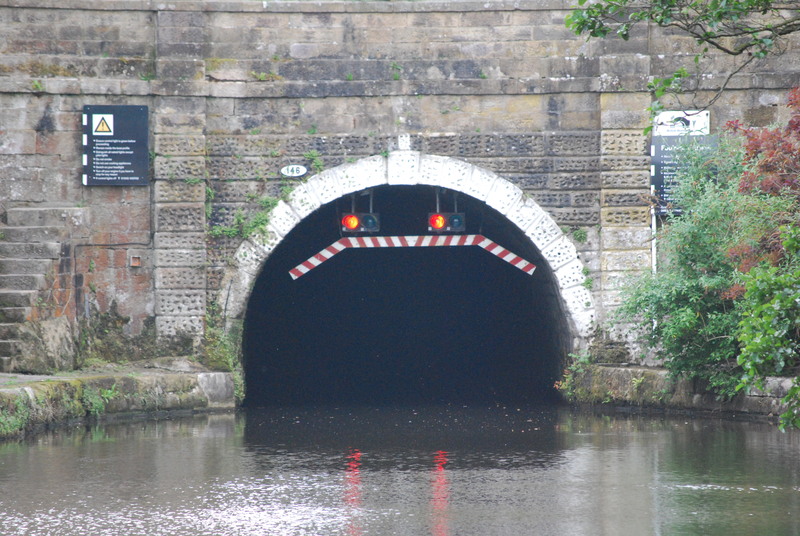 The canal tunnels under the main A58 road, and boats are only allowed to lock through under the supervision of a professional lock-keeper. It’s a major piece of canal engineering which demonstrates the thrust of the waterways preservation movement that first got underway in the 1960s. The journey through the tunnel and lock at Tuel Lane is portrayed at http://www.penninewaterways.co.uk/rochdale/rc5.htm. A different page of the same site leads to illustrations of other restoration achievements along the Rochdale Canal: http://www.penninewaterways.co.uk/rochdale/rc10.htm. The 48-page, A4 handbook for the 2011 Waterways & Railways across the Northern Pennines tour, with text, photographs, maps and a reading list, is available for purchase, price £15.00 including postage and packing. To view sample pages click here. Please send a cheque, payable to Mike Higginbottom, to 63 Vivian Road, Sheffield, S5 6WJ. This entry was posted in Transports of Delight, Waterways & Railways across the Northern Pennines on January 25, 2014 by Mike Higginbottom. Dent Station on the Settle & Carlisle railway is the highest main-line railway station in England. It stands 1,150 feet above sea level. Its remoteness is such that it lies four miles from the village of Dent, six hundred feet below in the dale. The site is so bleak that the stationmaster’s house was built with integral double-glazing. The stretch of line to beyond the summit at Ais Gill (1,168 feet) was notoriously difficult to keep open in snow. The trackside snow-fences of wooden railway sleepers are a gaunt reminder, even at the height of summer, of conditions in the worst of winter. In 1947 the drifts reached to the road bridge north of the station platforms and took three weeks to clear. There is a story, related in the Settle-Carlisle Partnership website [http://www.settle-carlisle.co.uk/stations/dent/storyinfo.cfm?c_Stn=004] of a signalman dying in the Dent signalbox, and his relief laying him on top of the locker until they were relieved at the end of the shift. After the station buildings were sold in 1985 Neil Ambrose spent twenty years restoring the down-side building. In 2006 a quantity surveyor, Robin Hughes, bought it for £250,000 and spent a further £150,000 upgrading the interior as holiday accommodation for six. The adjacent Snow Hut, provided as a base for the track workers who battled, often unsuccessfully, to keep the line open in winter, is now a studio bunk barn for two (or, at a pinch, three). Details of Dent Station and the Snow Hut are at http://www.dentstation.co.uk/index.php. This entry was posted in Life-enhancing experiences, Transports of Delight, Waterways & Railways across the Northern Pennines on January 4, 2014 by Mike Higginbottom. There’s really no other reason to get off the train at Garsdale except to go walking in the wild scenery. There are numerous round walks of varying degrees of difficulty starting from the station. 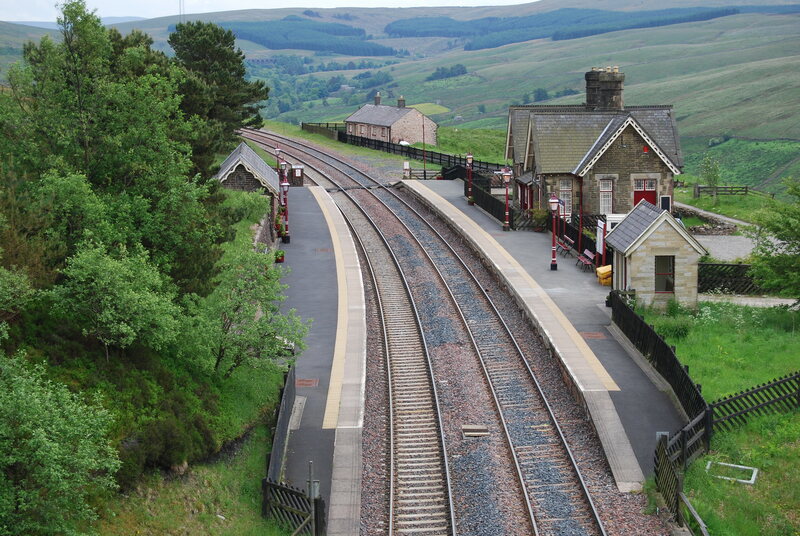 Nevertheless, Garsdale Station has numerous claims to fame. Opened with the Settle & Carlisle Railway in 1876, it was originally known as Hawes Junction, because it was the starting-point of the branch line up Wensleydale to Hawes and onwards to Northallerton. The branch closed to passengers in 1964 and was dismantled west of Redmire. There are plans eventually to reopen the entire line. A locomotive depot was planned at Garsdale but never built. It proved easier to bring banking engines up the line than to service them in such a remote spot: indeed, the locos would routinely have frozen solid. The 40,000-gallon water-tower that fed the highest railway water-troughs in the world was steam heated, and its base was used as the village hall with a 200-volume library. The waiting room was regularly used for church services. Garsdale was also the location of a legendary incident in 1900 when the wind caught a locomotive on the turntable and spun it uncontrollably until the crew poured sand into the pit. As a result, a timber stockade was afterwards built round the turntable. The actual turntable is now installed at Keighley. The station closed, along with almost all the others on the line, in 1970, and reopened from 1975 to serve the Dalesrail trains by which the Yorkshire Dales National Park and other bodies regenerated the line in the face of government opposition. 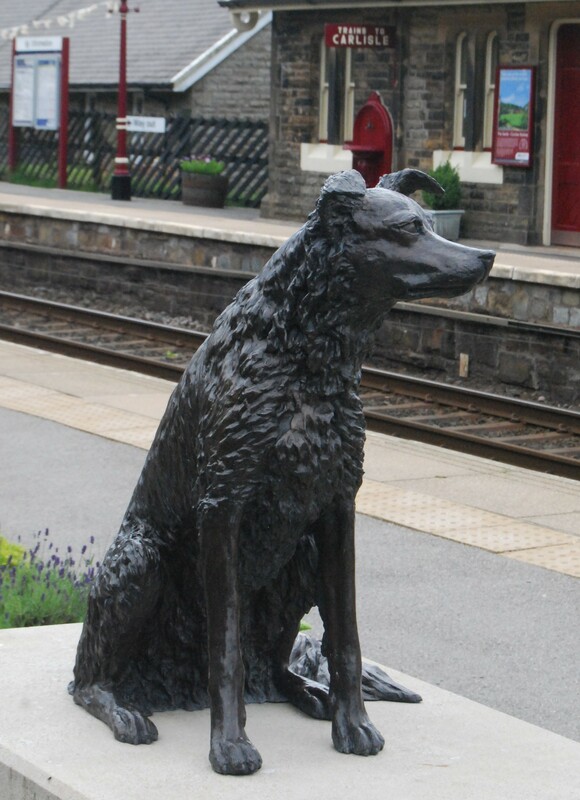 The up platform of Garsdale Station has a memorial to Ruswarp (pronounced “Russup”) the border collie which along with 22,265 people registered an objection to the closure of the railway in the 1980s. As a regular fare-paying passenger the dog was permitted to register an objection with a paw-print. Named after a railway viaduct and a station near Whitby, Ruswarp was the companion of Graham Nuttall, one of the founders of the Friends of the Settle-Carlisle Line. Graham and Ruswarp went walking in the mountains above Llandrindod Wells in January 1990 and did not return: Ruswarp was found, guarding his master’s body, eleven weeks later. The fourteen-year-old dog was so weak he had to be carried from the mountain: cared for by a local vet, Ruswarp lived long enough to attend Graham Nuttall’s funeral. On April 11th 2009, twenty years to the day after the line was reprieved, the statue of Ruswarp, by the sculptor JOEL, was unveiled. Ruswarp is shown gazing across the line to the bench that commemorates his master. This entry was posted in Transports of Delight, Waterways & Railways across the Northern Pennines on January 4, 2014 by Mike Higginbottom. One tunnel-mouth looks very much like another – see Trouble at t’summit, O, brave new world, The Flute, No light at the end of the tunnel, Great Central and Slow boat to Cromford – but the stories are different. The 2,860-yard Summit Tunnel, which takes the Manchester & Leeds Railway through the watershed from the Roch to the Calder valleys was, at the time it opened (1841), the longest railway tunnel in the world. It was the scene of a particularly spectacular railway accident, even though the derailment took place underground almost exactly a thousand yards from each portal. On December 20th 1984, a southbound train of petrol tank wagons was derailed by a defective axle-bearing almost at the mid-point of the tunnel. The three-man crew evacuated to raise the alarm at the nearest telephone outside the south portal. This meant walking or running along railway sleepers in the dark for something like three-quarters of a mile. Under fire-service protection, they re-entered the tunnel, where the tankers were already ablaze, and with some difficulty detached the first three wagons which were still on the rails and drew them out of the tunnel. The remaining ten wagons blazed on, and two of them melted. Vapour flew up two of the tunnel ventilation shafts at speeds estimated at 110mph, bursting into flames 150 feet high in the open air. Seventy local people were evacuated as a precaution, but no-one – train-crews, firefighters or members of the public – was injured in any way. It was a remarkable emergency operation. The tunnel was too hot to enter until December 27th; the fire brigades eventually handed it back to British Rail on January 3rd. Train services through the tunnel resumed on August 19th 1985. Alongside the bravery and expertise of the fire and police officers at the scene, the sang-froid of the railwaymen is impressive. They had to unhitch tankers full of petrol from other tankers well ablaze, reversing the diesel locomotive to push back and unhook the couplings. Then they drove out of the tunnel into the dark night. The Department of Transport report [http://www.railwaysarchive.co.uk/documents/DoT_Summit1984.pdf] states that later the same night “after inspection this part of the train went forward to its destination”. This entry was posted in Transports of Delight, Waterways & Railways across the Northern Pennines on December 30, 2013 by Mike Higginbottom. When I gave a lecture recently to the Driffield Wolds Decorative & Fine Arts Society [http://www.nadfas.org.uk/default.asp?section=209&page=1046], I met Ian Toon, who was about to canoe the Yorkshire length of the Leeds & Liverpool Canal from Foulridge Tunnel down to Leeds. I was impressed. I can see that canoeing a canal is an excellent way to see every yard of waterway at close quarters, and to enjoy the wildlife as well as the history. How much of the scenery you see from water level is another question, but it’s an experience most of us will miss. Foulridge (usually pronounced “Foalridge”) is a good place to start an exploration in either direction, by canoe, by narrow boat or on foot, because it’s downhill all the way in either direction. It’s also a relevant place to consider the dilemmas the original canal surveyors faced as they plotted their routes across the Pennine hills. The traditional, James Brindley solution was to hug the contours regardless of the distance: this is what the Leeds & Liverpool Canal does, and it’s 127¼ miles long with two tunnels. The alternative was to save mileage with a tunnel: the Huddersfield Narrow Canal, highest in England at 684 feet above sea level, punches the three-mile Standedge Tunnel through the hillside; it’s not quite twenty miles long, but it took seventeen years to complete. The Rochdale Canal, 33 miles long, has no tunnel, was finished in ten years, and was bedevilled by water-supply problems. There was a major argument when the Leeds & Liverpool Canal was under construction about whether it would be cheaper to tunnel at Foulridge, or to carry the canal higher and increase the mileage further. The engineer, Robert Whitworth, airily declared that building Foulridge Tunnel would be “a small affair…compared with what has been done in other canals”. In fact, it took five years, 1791-6. It proved a liability when the lining failed in 1824 and again in 1843, and there were such difficulties in between those dates that the canal company engineer, Samuel Fletcher, estimated it would cost £23,000 to open it out as a cutting. In the end, the tunnel was repaired, and it’s been kept in repair ever since. The main problem on the Leeds & Liverpool is and remains, ironically, water supply: for much of the nineteenth century the company kept building additional reservoirs, the last in 1893. As recently as 2010 the upper stretch of the canal was closed for lack of water. Hindsight is easy, of course: it was a different matter for an eighteenth-century engineer staring at a hillside without so much as an Ordnance Survey map and deciding the best strategy. All three canals did their job, and the Leeds & Liverpool maintained traffic against rail competition until the early twentieth century and has always remained navigable. The other two trans-Pennine canals are once again navigable, despite decades of neglect [see The return of the Ring and Longest, highest, deepest]. Now you can walk, cycle, canoe or sail along these waterways with relative ease. This entry was posted in Transports of Delight, Waterways & Railways across the Northern Pennines on December 29, 2013 by Mike Higginbottom. The Wensleydale Railway [http://www.wensleydalerailway.com/index.html] at present is, in essence, a seventeen-mile railway siding through some of the most attractive landscape in Yorkshire. 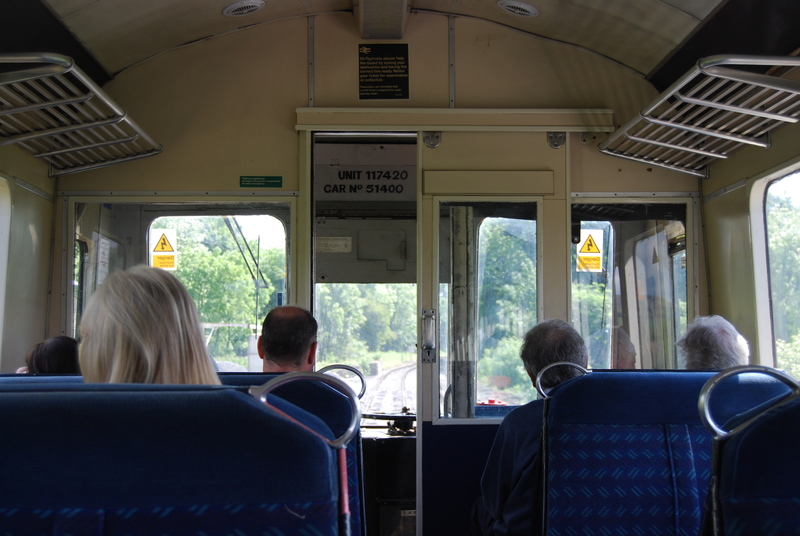 Its staple rolling stock consists of those wonderful 1950s diesel railcars when you can sit at the front looking over the driver’s shoulder at the track ahead. It potters through stations serving the towns and villages of the eastern end of Wensleydale – Bedale, Finghall, Leyburn. It has really exciting potential, and a hard-headed management team that shows every sign of achieving its targets. The line served as a link between the East Coast Main Line near Northallerton and the Settle & Carlisle Railway at Garsdale. Opened in stages between 1848 and 1878, the section east of Hawes was owned by the North Eastern Railway; west of Hawes belonged to the Midland Railway but the through service was operated by the North Eastern. The stretch west of Redmire was dismantled after 1964, while the line east remained in use for quarry traffic until 1992. In response to the imminent threat of final closure, the Wensleydale Railway Association was formed in 1990, initially committed to restoring environment-friendly passenger transport to the towns and villages of the dale and – given the assurance that the long-threatened Settle & Carlisle would after all remain open – ultimately dedicated to the long-term reinstatement of the whole line. Assisted by a Ministry of Defence undertaking to use the line to transport military vehicles from Catterick, the Association agreed terms with Network Rail to lease the existing track and reopened passenger services between Leeming Bar and Leyburn in 2003. The service was extended to Redmire the following year. Though the line uses historic rolling stock, including on occasions steam haulage, it is not so much an exhibition line as a serious transport route. Its administration is committed to hastening slowly, first upgrading the well-used existing track, next reinstating a link into Northallerton [http://www.wensleydalerailwayassociation.com/resources/NorthallertionOptionsAssessmentNov+09.pdf] and then extending from Redmire to the popular tourist destinations of Castle Bolton and Aysgarth Falls [http://www.wensleydalerailway.com/091009_Final_Wenselydale_Railway_Socio-economic_Study_Issue.pdf]. The more ambitious project to restore the missing link to Hawes and Garsdale – which requires repurchasing land, rebuilding bridges and in effect constructing a new railway – must wait. Earning revenue by providing a service comes first. For the moment, this admirable line provides an enjoyable outing between Leeming Bar, just off the A1, to Redmire, linking with a vintage single-deck bus service to and from Ripon, calling at Jervaulx Abbey, Castle Bolton and Aysgarth Falls. One day, it will be possible once more to make a round trip along the East Coast Main Line, the Wensleydale Railway and the southern part of the Settle & Carlisle. Serving that traffic will need more than a couple of diesel railcars. The 48-page, A4 handbook for the 2011 Waterways & Railways across the Northern Pennines tour, with text, photographs, maps, a chronology and a reading list, is available for purchase, price £15.00 including postage and packing. To view sample pages click here. Please send a cheque, payable to Mike Higginbottom, to 63 Vivian Road, Sheffield, S5 6WJ. This entry was posted in Transports of Delight, Waterways & Railways across the Northern Pennines on December 28, 2013 by Mike Higginbottom. 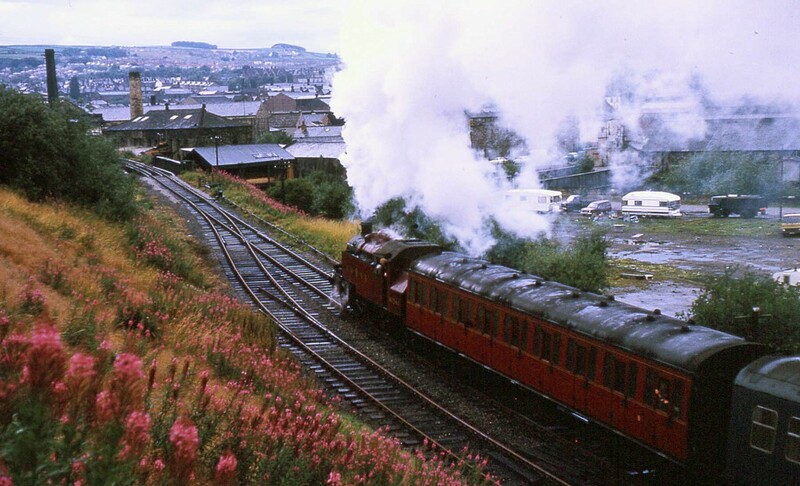 Among the preserved steam railways of Great Britain, the Keighley & Worth Valley Railway [http://www.kwvr.co.uk] was notably quick off the mark. The line also benefitted, both financially and in terms of publicity, as the location for the Lionel Jeffries’ 1970 film The Railway Children and John Schlesinger’s 1979 film Yanks. One of its other proud claims to fame is that it is the only railway that serves real ale in its buffet car. The railway’s real-ale festivals are, by all accounts, jolly affairs. This branch, opened in 1867 and operated from the outset by the Midland Railway, was not the only railway in the valley. The rival Great Northern Railway reached Keighley in 1882 by a contorted system connecting Bradford, Halifax and Keighley linked by an unusual triangular station at Queensbury. The Queensbury-Keighley route trailed into the Worth valley through the 1,533-yard Lees Moor Tunnel, built on a ninety-degree curve that was no fun to drive a steam loco through. Almost all of this improbable network has disappeared and can be best explored at http://www.lostrailwayswestyorkshire.co.uk/Queensbury.htm. Lees Moor Tunnel became, of all things, a caravan park: http://www.forgottenrelics.co.uk/tunnels/gallery/leesmoor.html. The Leeds & Liverpool Canal, begun in 1770, climbs the valley of the Yorkshire Aire on its way to the watershed leading to Lancashire. As you walk up the towpath through Bingley you encounter one of the 91 locks, then a staircase of three, the Bingley Three Rise, and then a further staircase of five, the Bingley Five Rise. This joyful and much wished for event was welcomed with the ringing of Bingley bells, a band of music, the firing of guns by the neighbouring Militia, the shouts of spectators, and all the marks of satisfaction that so important an acquisition merits. The first journey down the Five Rise, a fall of 59 feet 2 inches, took 28 minutes. 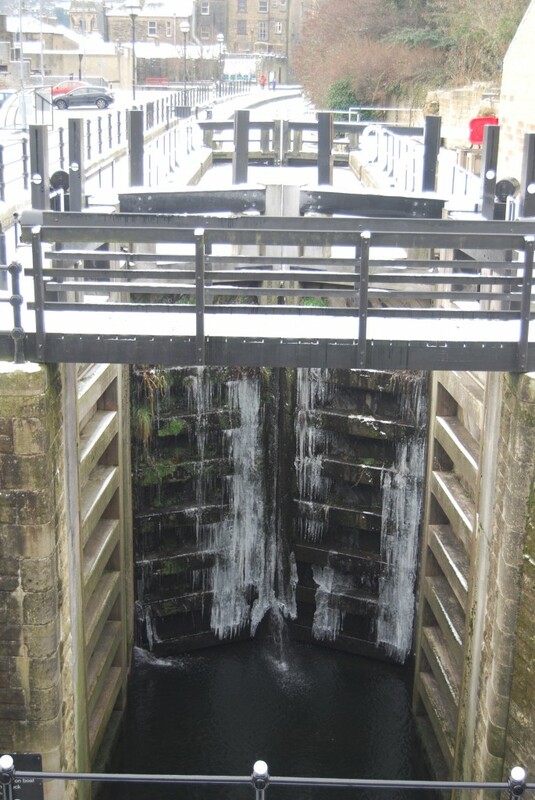 The Five Rise is a staircase, which means the bottom gate of the top lock serves as the top gate of the next lock down: once a boat starts to ascend or descend it has to keep going to the level pound at the end. Now that the traffic consists entirely of leisure cruising a professional lock-keeper supervises all transits: his name is Barry Whitelock, a man so celebrated that he was awarded an MBE for services to inland waterways in the North of England. The Five Rise is also a place to contemplate the energy and pride of the eighteenth-century canal builders, hoisting the country into the industrial age. Take a look at the impeccable stonework, the robustness of the gates and paddles, and the utterly straightforward management of water under gravity. It’s not actually true to say they don’t make them like that any more: the moving parts were renewed as recently as 2006. To see the stretch of canal before and after the Five Rise, go to http://www.penninewaterways.co.uk/ll/bingleyfiverise.htm.